I arrived in Mumbai early in the morning, little before sunrise. The flight went fine. I had booked a hotelroom via internet and an airport-pickup from the hotel. But there was no taxidriver with my nameboard waiting for me at the gate. So I called to the hotel, and a speaking-louzy-English-man explained, that the taxidriver had not been able to come, because he was having some festival..
Oh well, I went to the prepaid-taxi-counter, and there was one Western guy, who had come from Germany with the same plane, and since we both were heading to Colaba, he suggested that we’d share a taxi. And so we did. It was Rs500 cheaper than the pickup this way. 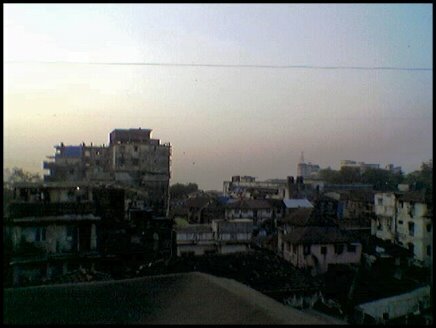 The sun was rising when we drove through Mumbai to Colaba. First I went to the hotel, where I had booked the room, but since I didn’t like the room, I let them down as well and didn’t take it (karma works this way also!) The taxidriver knew another hotel from the nearby neighbourhood, and I went to see it, liked it, and stayed there. The room was even Rs100 cheaper than the first one, it had a nice view from the 4th floor over Mumbai to the sea, and I was able too see the sun rising and setting, as well as the top of Taj Mahal, which by the way in Mumbai is a hotel only..
Well, this is all from here for now – I went for a dinner, had a Dal Fry, and when I noticed an internetcafe, I decided to drop in, and drop a few lines for you. It’s nice to be here in Mumbai. Luckily it is not as hot as in June.